Put some spice in your fiesta! Celebrate and decorate with our fun and festive fiesta decorations and party supplies. PartyCheap has a great selection of decorations, wall hangings and cutouts and colorful table and drink ware to get your shopping list finished. 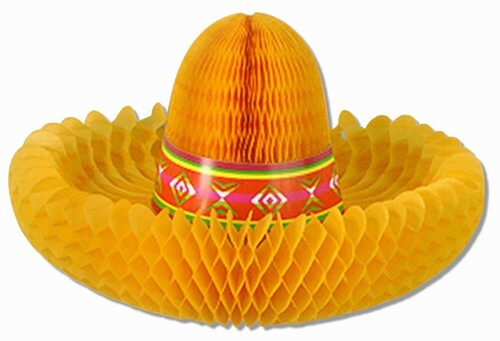 Our large selection of fiesta party decorations are sure to set an authentic feel. Many of our decorations are made of all-weather material, making them a a natural part of your shopping list! Cinco de Mayo celebrates the Mexican victory over France at the Battle of Puebla during the Franco-Mexican War (1861-1867). Mexicans Independence Day is May 5th, it's September 16. In Mexico it's called El Día de la Batalla de Puebla (The Day of the Battle of Puebla). The festival is more widely celebrated in the U.S. than in Mexico. The largest celebration in the U.S. is in Los Angeles, Ca. According to the California Avocado Commission, more than 81 million avocados are consumed by Americans during the celebration - usually in guacamole. It's considered the biggest day for margarita sales in the USA. MEXICAN JUMPING BEANS - While playing Mexican music in the background, have everyone jump around like Mexican jumping beans. When the music stops, everyone must freeze. If anyone moves or laughs, they are out, continuing until there one person left. HOW MANY PEPPERS CAN YOU COUNT? - As your guests arrive, have them each write down how many chili peppers they think are in a jar. The one who comes the closest wins. CHILI PEPPER WADDLE - Divide your guests into two teams and give each team an inflatable chili pepper. On "Go!" the first player on every team puts their chili pepper between their legs and waddles to the finish line and then waddles all the way back. The game continues in the same fashion. The team that finishes first wins this game. MUSICAL MEXICAN HATS - Just like musical chairs, the object of the game is to NOT be the one without a hat when the music stops. To play form the players in a circle. In the middle of the circle place one less hat than there are players. (Boppers are another option for head wear) When the music strats the contestants move in a circle around the hats (choose a direction before hand so there's n confusion!). When the music stops everyone scrambles for a hat and puts it on their head. The person without the hat is eliminated, the hats, minus one, are placed back in the middle and the music begins again. The last person with the hat is the winner. MEXICAN RING TOSS - A blow-up cactus cooler can keep your drinks cold and entertain your guests at the same time! Make guest toss a ringer onto the cactus to get a drink! POR FAVOR - Think of it as a politer version of Simon Says. Directions that include "Por Favor" should be followed, those without shouldn't. LIMBO – Kids love it, enough said! DON'T SAY "NO" - Give each guest a string of fiesta beads. The goal is to collect as many beads from the other guests as as they can by getting other guests to say the word "no." Party goers will need to mingle with each other and ask questions to try to get a "no" from the person they're chatting with. Whoever ends up with the most beads at the end of the night or after a set amount of time wins.